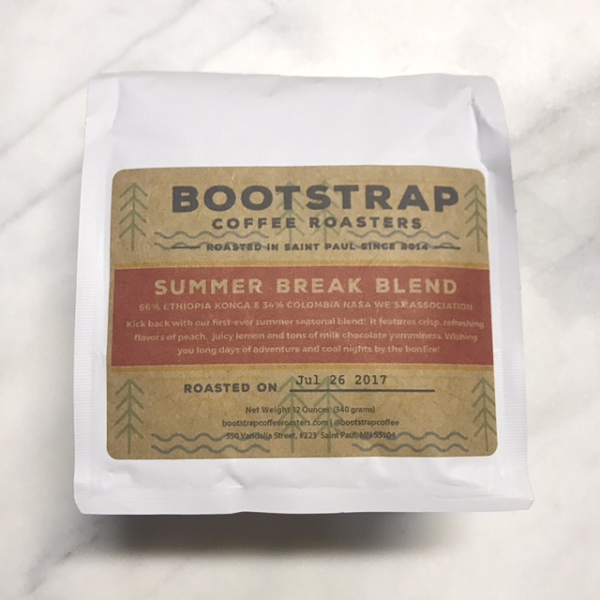 This is the second coffee we’ve reviewed from specialty coffee roaster, Bootstrap Coffee. This is a blend of two coffees, with 2/3 of the beans coming from Ethiopia, and the other beans from Colombia. Though it was designed to be a coffee, it also works well as an espresso. As an espresso it’s surprisingly sweet, butterscotch, peach, tangerine with a semi chocolately and a full finish. This is a very good espresso and would work well for espresso based drinks. It has a nice, but not over powering balance and would appeal to many drinkers. As a coffee, there is a lot of flavor happening here. Depending on the sip, it’s both juicy and chocolatey. The thing from our standpoint is the flavors aren’t always complimentary, It’s a unique coffee, that might have too much flavor and deviate too much for some coffee drinkers.